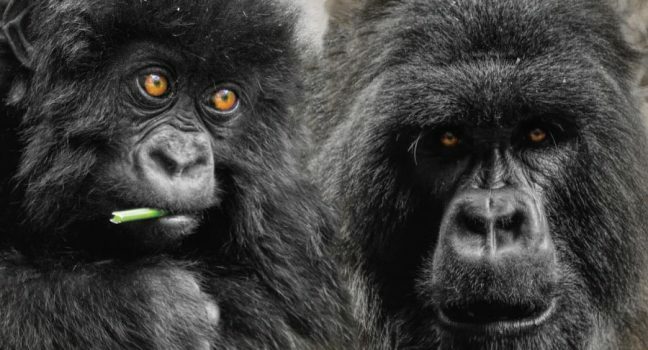 On this Rwanda Gorilla Tracking & Golden Monkey Safari we take you to the Virunga mountain range in the jungles of Volcanoes National Park (Parc National Des Volcans) in search of the mighty beasts, the mountain gorillas and the beautiful golden monkeys. You will be met by East African Jungle Safaris driver guide at the Kigali International airport and stop for lunch then after drive to Musanze if time allows you you will visit two twin Lakes Burera and Ruhondo. Their deep blue waters ringed by steep hills and tall waterfalls with the outlines of the nearby Virunga Volcanoes provide a spectacular backdrop. You will be met by Golden Rwanda Tours and Travel driver guide at the Kigali International airport and stop for lunch then after drive to Musanze if time allows you you will visit two twin Lakes Burera and Ruhondo. Their deep blue waters ringed by steep hills and tall waterfalls with the outlines of the nearby Virunga Volcanoes provide a spectacular backdrop overnight at Virunga Hotel/Muhabura Hotel. After an early breakfast, you will proceed to Volcanoes National Park (Parc National Des Volcans) headquarters – Kinigi to meet your guides for the day. After completing our park formalities, we are embarking on a once in a life time experience of mountain gorilla tracking. Once you spot them you are allowed to spend an hour watching your closest long lost cousin. Return to your hotel for lunch and later maybe Visit Ibyiwacu culture village center then dinner and overnight again at Virunga Hotel/Muhabura Hotel. The best time to visit is during the dry season (mid-May to September). November and April are the wettest months. Tsetse flies and mosquitoes can be bad enough to seriously detract from your safari enjoyment, so bring a good insect repellent.